Gerakan Pramuka Indonesia or called Indonesian Scout movement is a name of non-formal education organization that performs scouting education in Indonesia. Its founded in 1961 by Sri Sultan Hamengkubuwono IX, and in 2011 Gerakan Pramuka Indonesia became the world’s largest scout association in the world with members of about 17 million. Pramuka is derived from word “Praja Muda Karana” which means young soul that loves to work. Gerakan Pramuka Indonesia is an education process outside formal environment (school). As well as family education that is wrapped as an interesting, fun, healthy, arranged, focused, and practical activities that may be done in nature as an outdoor activity. Every activity is performed according to the Scouting Basic Principal (Prinsip Dasar Kepramukaan) and Scouting Method (Metode Kepramukaan). The final goal of these activities is the formation of character, morals, and noble character of young people in Indonesia. We also must know that scouting in Indonesia was built as an education system that was adjusted with the interests and development of society and the nation of Indonesia. For further information about Gerakan Pramuka Indonesia or Indonesian Scout movement we will explain it in detail includes history, logo, program, and awards of Gerakan Pramuka Indonesia below. Firstly, scouting was developed by Lord Baden Powell in England to educate young people that involved in crime and violence. He educated 21 young people in 1907 intensively for 8 days and showed a good result. This successful story was written in a book called “Scouting for Boy”. This book then inspired people from all around the world includes Indonesia. Some scouting organizations started to establish in 1950 until 1960, and these organizations were affiliated with political parties or social groups. However unfortunately, these organizations did not have a same vision to support national development as well as youth development that may continue national unity. Due to the condition above, some national figures try to find a way to build a good scouting organization in Indonesia. And 1961, president of Indonesia, Ir. Soekarno, gathered all of the leaders of the scouting organization in Istana Negara. Soekarno said that Indonesia needed a scouting organization that would satisfy national and international needs. He also decided to merge all the scouting organizations in Indonesia with a new method and approach and then was called Gerakan Pramuka. Belief and piety to God almighty. Care for our nation and homeland, fellow life, and nature. Care for their own personality. 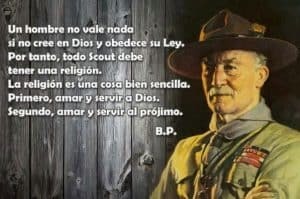 Obey the Scouting Honor Code. “Directing and make young people as the key subject of Pramuka that are innovative, relevant, that creates and mobilize the change of nation, country, and Indonesian people in 21th century according to the sacred mission of Indonesian Scout Movement”. The flag of Gerakan Pramuka is using the sprouting coconut seed as the logo. The philosophy of this emblem is because coconut is a common native Indonesian plant and all parts of this plant are used in Indonesian everyday life. It symbolizes that a true scout must make him or herself useful in all aspects of life. The seed form also represents the growing spirit, physical toughness, adaptability, and high aspiration of the Scout. The flag has red stripe which is a symbol as the base for adding the name of the Indonesian scout’s units. 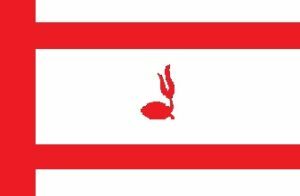 So, when the flag is assigned to a particular unit, there will be the name / number of the unit in the red vertical shape. Practice of Scouting Honor Code. Group activities, cooperation and competition. The presence of adults who provide guidance, encouragement, and support. Reward as a proficiency achievement. A separate unit between boy and girl scout. Pramuka Pandega (Senior Rover Scouts), the members are 21 to 25 years old, or equal to academy / university students. Adult members – ages 26 and older. In Gerakan Pramuka Indonesia, all activities are mainly carried out to achieve advancement through Advancement Badge or called Syarat Kecakapan Umum (SKU) dan Merit Badge or Syarat Kecakapan Khusus (SKK) system. The assessment is carried out in a camping. And the highest rank in each group is Pramuka Garuda or called Eagle Scout. As the member of World Organization of the Scout Movement (WOSM) since 1953, Gerakan Pramuka Indonesia is labeled as the largest scout association in the world with member of 17.103.793. Gerakan Pramuka Indonesia is also actively involved in competition and cooperation with scout association from another country. The latest award that has been achieved is Friendship Award from National Scout Organization of Thailand in 2016. Moreover, Gerakan Pramuka Indonesia has collaboration with American Boy Scouts in Jakarta and Balikpapan which are linked to the Direct Service branch of the Boys Scouts of America and supports units around the world. Gerakan Pramuka Indonesia becomes one of the important educations in Indonesia because it has a history of Indonesia’s struggle and it shows how young people in Indonesia took a part in Indonesia’s development. It is good for us to know Gerakan Pramuka Indonesia, we can take a value from this education that young people are the asset of a country. At first, they maybe do not have a good character, but everybody can change and Gerakan Pramuka may be an answer to change people. Young people is trained and educated so they will be involved to improve Indonesia to be a better nation. This is the story of Scouting in Indonesia. There are many scout organization around the world, and in my opinion Indonesia has the most unique scout organization in the world. Knowing Gerakan Pramuka Indonesia is an additional knowledge for us to know Indonesia more. We will also discover the other uniqueness of Indonesia through this blog. Please look forward for our next article about Indonesia’s fact.